To continue enjoying TWOQC’s programs and events, all current members must renew and 1-time guests must join for 2017 by January 31. Visit the membership page for instructions and the application by clicking «HERE». Or click this link to download the «Membership Application». *NOTE* January’s program is a morning program starting at 10:00 a.m. «Diane Foray» will be presenting on the color Red and its’ use in artistic expression. Ms. Foray is a docent at the Tucson Museum of Art. TWOQC Scholarship deadline is midnight January 31. Thanks to your great support and generosity, and our partnership with the Sahuarita School District’s foundation (SEEF), we will offer two scholarships to senior women graduating from each high school. Walden Grove and Sahuarita High will each receive $3,000 in award money. This is a big step up from last year. THANK YOU! On February 1 the scholarship applications are gathered and copies made for everyone on the screening committee. We encourage anyone who would like review the applications and recommend finalists to the Scholarship Committee to notify Bonnie Hyra (777-4230). Bonnie will provide important training. As February 24 draws closer, we are looking for more donations for raffle prizes. Perhaps 2 or 3 of you could buy ingredients for an Italian meal as well as a bottle of Chianti. Or maybe some spa products. If you are into crafts, some jewelry, a ceramic dish or a glass creation, a painting or mounted photo would be much appreciated. Are you a massage or relaxation therapist, a personal trainer or exercise instructor and willing to donate a session (and get publicity in return)? Those would make great prizes. 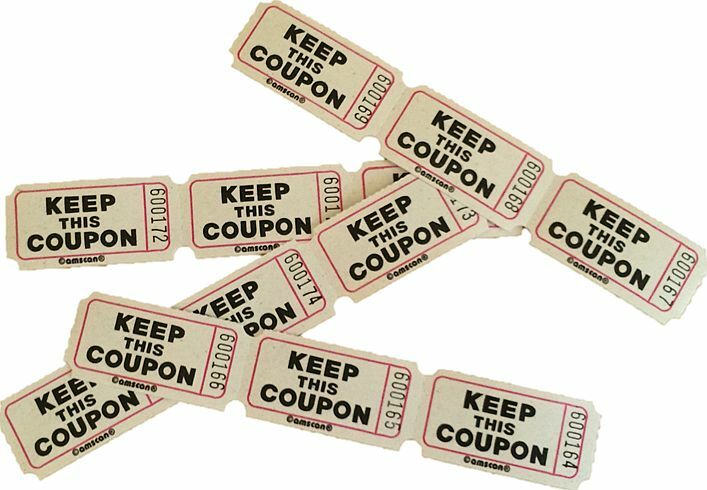 Raffle prizes maybe dropped off at Carol Shelton’s, 2014 E Overview Lane (map) or Ginny Hutcheson’s, 2494 E Bluejay Bluff Lane (map). Be sure to include your contact info so that your donation can be acknowledged after the event. We are in need of creative volunteers to assemble the donations into baskets in February, date to be determined. If you can help, please contact Carol Shelton at «fashionshow@womenqc.com». Sponsorships — We are also offering sponsorships at the April 8th Relay For Life event at the Rancho Sahuarita Clubhouse. Ginny will even deliver the tickets and sponsorship forms. Cash, check or credit card to the American Cancer Society. Sponsorship donations are fully tax deductible. The baby shower committee met on Wednesday and accomplished several goals beginning with a theme, “Tiniest Patriots.” With the shower being held on Armed Forces Day this year, the theme is quite appropriate. Our new mom count is up to 9 military families and counting! Contributions of diapers, onesies, and outfits are great, useful gift ideas. If you are interested in donating, items may be dropped in the collection box on the front porch of the event chairperson, Pam Rodgers at 2640 E. Sawyer Road (map). Our next planning meeting is Wednesday, February 15 at 1:00 p.m. in the Kino Conference Room. All are welcome to join in and help. We would love to have you as part of the team! 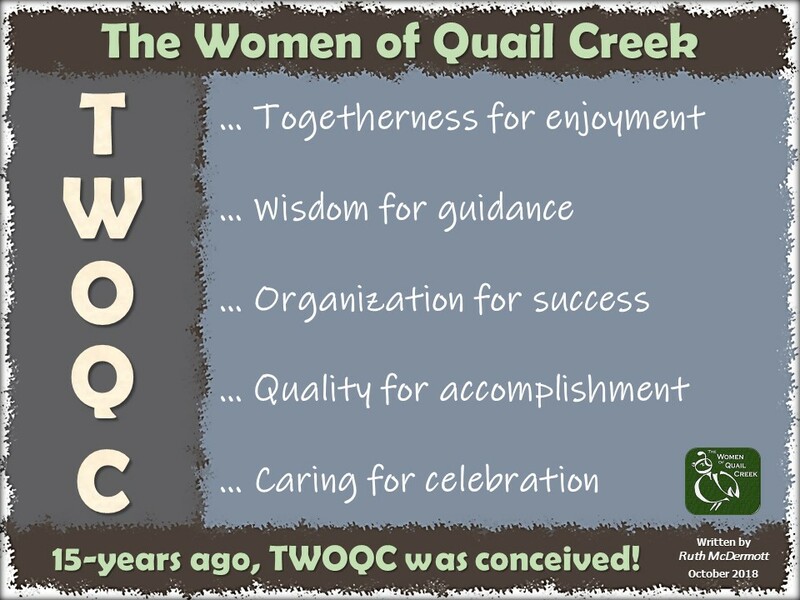 This entry was posted in Announcements and tagged carol mutter president, green valley, quail creek country club, the women of quail creek, twoqc facebook. Bookmark the permalink.